Any plant that has been in cultivation for 300 years must have something going for it, Magnolia denudata is one such plant. It is the sheer beauty of the flowers that appear on the bare branches in late winter to spring that are the attraction. The flowers are regarded as a symbol of purity and have a slight lemon perfume to them. Also known as the ‘Jade Lily Tree’, it is as an ornamental garden tree that they grown as today. 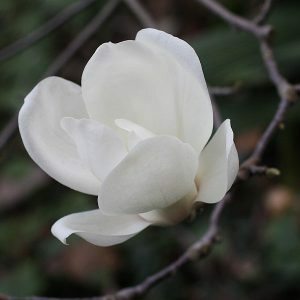 One of the best white flowering species, Magnolia denudata is an excellent specimen tree. Wonderful pure white goblet shaped flowers on bare stems in early spring make this a standout small tree. The growth rate is fairly slow and it is possible to grow these as a specimen in a container. Foliage is a glossy green and this is a small tree that can reach 5m in height although often much smaller. Flowers are fragrant but not overwhelming. The growth habit is naturally erect at first tending to a more spreading tree with age. with a short trunk foliage and flowers flow right down to low levels. If planted in good soil, in a protected position Magnolia denudata needs very little care at all. Mulching to help retain moisture and a cool root run through summer is beneficial. Some additional fertiliser in spring every few years is all that should be required. In general very little to no pruning is required, Magnolia denudata can be pruned to maintain shape, and any dead or damaged wood can be removed with a sharp pruning saw. In our experience the natural growth habit is best. Best in a sunny position in a warm to temperate climate, but protected from strong afternoon sun and hot winds. A humus rich moist soil is most suitable. As Magnolia denudata has a rather shallow root system it is better to mulch around the tree to the drip line than it is to underplant. Height – Will reach around 5 metre over time. Spread – will form a crown of around 4 – 5 metres. Position – Best in full sun with a little afternoon shade in very hot areas. Best protected from hot drying winds. Flowers – Clean pure white. Foliage – Mid to deep green, deciduous.